Eight members of the United States Marine Corps from Camp Pendleton volunteered alongside Vitas Hospice Care to visit with senior residents of Raincross MBK Senior Living Community in Riverside. Leticia Goodwin and April Lilly-Topachikyan, both field reps with Vitas Hospice Care, organized the event. Lilly-Topachikyan is a former Marine who served with Gunnery Sgt. Juan C. Manco, the Staff Non-Commissioned Officer in Charge of this volunteer effort. On the Marinesâ visit to Raincross on April 11, they exchanged stories with many of Raincrossâ veteran residents, including Leonard Shaw, a 91-year-old former pilot who flew Air Force One and Two for the White House from 1955 to 1963. Shaw had the thrill and privilege of piloting for five U.S. presidents as well as many world dignitaries while his wife, Emily, held a position as Special Analyst to the Secretary of the Army in the Pentagon for 28 years. Veteran resident Fred Konkel, a B24 Bomber Pilot who flew 15 missions during World War II, was awarded the Distinguished Flying Cross and a Purple Heart for his bravery and service. Konkelâs good friend and fellow Raincross resident Ed Paulino was awarded four Bronze Stars for serving in four major battles during World War II as a Field Artillery Sergeant. The Marinesâ visit to Raincross provided a unique forum of storytelling between those who have served in the past to ensure our freedom today and those who are currently serving to secure our freedom for our future. Other Raincross veterans who shared their stories were Ben Herbert, Pete Smith, John Torola, Richard Perry, Harry Devereaux, Ralph Cowart, Gordon Tenpas, Vern Formoe, Stanley Randall, Richard Roach and Robert Miller. âThese veteran residents shared amazing stories of their time in the service. My sense of gratitude could never be expressed in just a few words for what these veterans contributed in past wars such as World War II, Korea and Vietnam,â said Manco. Lilly-Topachikyan and Manco, who consider each other to be family after 15 years of friendship and service, were inspired to give back to their elders but agreed that everyone, especially the currently serving Marines, came away with life-changing stories and memories. Gov. Jay Nixon traveled to the Missouri Veteransâ Home in Mexico Wednesday to sign House Bill 1731 into law, providing a dedicated funding source for Missouriâs seven veterans homes where more than 1,300 military veterans live. The legislation ensures the homes will have the resources they need to provide high-quality, modern care in the next fiscal year, which begins July 1, and beyond. âIt is an honor to be here with our heroes,â stated Nixon as he addressed the residents, family and staff. After introducing dignitaries present, Nixon introduced six residents seated behind him and told of their military experience. The men are: Dudley McPike, United States Navy 1943-1945; Raymond Smith, United States Navy 1946-1947; Leonard Armontrout, United States Navy 1945-1946; Fred Fennewald, United States Army 1942-1945; Gerald Stubbs, United States Army 1943-1946; and Perry Reams, United States Army 1942-1945. Armontrout began the ceremony by leading the audience in the Pledge of Allegiance to the Flag. McPike said he did not expect to be part of the ceremony and it was more than he expected, stating it was emotional for him in some respects, referring to the remarks about veterans and the support they should receive. After signing the bill the governor presented a copy to each of the six men. Nixon stated those who serve in the military will always be veterans and they deserve respect, honor and support. "Make no mistake we will continue to stand with our military veterans." House Bill 1731 increases the transfer amount from the Missouri Gaming Commission Fund to the Veterans Commission Capital Improvement Trust Fund, providing a dedicated annual funding source of $32 million for the upkeep of Missouri veterans homes. Nixon had included full funding of Missouriâs veterans homes in his budget proposal to the General Assembly in January. The final legislation establishing the full funding and dedicated revenue source received strong bipartisan support in both legislative chambers. After the program, Cheryl Lybarger, administrator at the home, reiterated Muzlingerâs comment of it being a great day in Missouri. She said she appreciated the support by the legislators and the Missouri Veterans Commission for all the hard work they did to get the bill passed. âIt truly is a great day,â she added. Do you support the GOP version of the Dream Act, which would give a select group of high-achieving illegal immigrants the chance to become U.S. citizens? As a retired chief master sergeant in the United States Air Force, I am proud of my years of service. Yet the horror of my treatment when I was sexually assaulted by two instructors as a young airman multiplied the effects of the assault. For me, however, the reasons I served outweighed that trauma. Our military has a long way to go when it comes to treating victims of sexual assault (âAbortion funding fight could complicate defense spending legislation,â Web, Tuesday). Last week, the Senate Armed Services Committee took an important step when it voted for the Shaheen Amendment to the National Defense Authorization Act. I am particularly grateful to Sen. John McCain, Arizona Republican (for whom I voted in the 2008 presidential election), and fellow Republicans Sen. Susan Collins of Maine and Sen. Scott P. Brown of Massachusetts for putting our military before partisan politics in supporting this important measure. The amendment would repeal a long-standing ban on insurance coverage for abortions for servicewomen who have been raped. This would bring military policy in line with other federal programs. Itâs a matter of basic fairness and decency. I support the Shaheen Amendment because we need to be able to look our warriors in the eye and say, âI will take care of you.â When we do not fully protect any one sector of our troops, we arenât doing our jobs. Our servicemen deserve no less. It is not complicated and it in no way removes the pressure to stop sexual assault in the military. One is a matter of prevention and the other is a measure to afford victims fair and equitable coverage that other government employees and federal inmates already have. Â© Copyright 2012 The Washington Times, LLC. Click here for reprint permission. For Team CADET at Rice University, the answer is a device to stop high-velocity projectiles without destroying them. With the Air Force's current methods, artillery shells are destroyed beyond recovery. The Air Force wants to know more about their behavior as they accelerate and decelerate. "The challenge was to simulate high-acceleration impacts in a nondestructive way," said Duncan Eddy, a junior in mechanical engineering and member of the Controllable Acceleration-Deceleration Equipment Tester design team. "The problem turned out to have a hands-on, mechanical engineering focus." Currently, the Air Force simulates deceleration by firing cannons into walls. The strategy is expensive and the sensor module and target are typically destroyed in the process. Team CADET's goal was to sustain deceleration for at least 10 milliseconds, and without destruction. They machined a cylinder of aircraft-gauge aluminum and sealed a digital accelerometer inside. Next, they built a 14-foot wooden frame to hold a track fashioned from angle iron. "Nothing is destroyed. You just fill the tank with water again and reload the slingshot," said Eddy, who stressed that the prototype can be scaled to any size. "We started last fall with a ton of different ideas but ended up with a plan that is simple and inexpensive, and the scale can easily be changed â" a bigger tank, more water, more holes, a longer track, a bigger slingshot," Eddy said. "They liked what they saw and said they were interested in exploring the idea further. We know we've created something entirely new. The parts are not new but the combination is. Also -- and this is important -- we came in under budget," Eddy said. Survivors include sons, Michael (Mary) Puckett, William (Pamela) Puckett; daughter, Coleen Puckett; 8 grandchildren; 17 great-grandchildren; sister, Lillian Pettit; host of nieces and nephews. Predeceased by parents, wife Luella, 12 sisters and brothers. A Memorial Service will be held at 11:00 a.m. Saturday, June 2, 2012, at the First Baptist Church of South Beloit, 14035 Dorr Road, South Beloit. Pastor Ken Schmoyer officiating. Cremation Society of Illinois assisted the family. To express condolences, go to Cremation-Society.com. WASHINGTON â" Some Republican lawmakers were outraged when federal records released recently showed that the White House, CIA and Defense Department granted high-level access last year to a pair of acclaimed filmmakers researching an action thriller about the raid that killed Osama bin Laden. The documents tell âa damning story of extremely close, unprecedented, and potentially dangerous collaborationâ between the filmmakers and the Obama administration, fumed New York Rep. Peter T. King, GOP chairman of the House Homeland Security Committee. The Defense Departmentâs inspector general is investigating whether any classified information was improperly disclosed. But barring that, the episode is just the latest in an increasingly close, cooperative arrangement â" spanning administrations â" that gives Hollywood extraordinary access to military assets and CIA operatives. In turn, the Pentagon and CIA have exercised subtle and not-so-subtle influence on scripts and helped burnish their images on screen. Peter Berg, who directed the recently released science fiction film âBattleship,â was allowed to use five Navy warships during production, and cast Navy Secretary Ray Mabus in a cameo role. Mabus later helped launch the film at a Washington screening for Navy brass and service members. The Navy weighed in twice for changes, Berg said. Berg clearly has good relations with the Navy. He embedded for a month with Navy SEALs in western Iraq as research for an upcoming military film, âLone Survivor.â Few journalists have gotten that access. Filmmaker Lionel Chetwynd was granted an hour with President George W. Bush for Showtime Networksâ âDC 9/11: Time of Crisis,â a patriotic 2003 docu-drama about the White House response to the Sept. 11 attacks. The latest flap concerns more than 250 pages of CIA and Pentagon emails and other records showing how national security officials cooperated with Hollywood director Kathryn Bigelow and screenwriter Mark Boal for an election-year spy thriller expected to portray President Barack Obama in a positive light. Nothing in the documents â" obtained under the Freedom of Information Act by Judicial Watch, which describes itself as a conservative organization â" indicates that the filmmakers were given classified material. But David Robb, author of âOperation Hollywood: How the Pentagon Shapes and Censors the Movies,â sees other dangers. The militaryâs symbiotic relationship with movies dates to the 1920s; the Pentagon regularly traded warships, bombers and technical expertise over the decades for a chance to glamorize the military and boost recruitment. The CIA has kept an entertainment liaison on staff only since 1996. At that point, the Cold War had ended, and the agency was fighting for its budget and its existence on Capitol Hill. The new mission was clear: to overcome the CIAâs image in popular entertainment as incompetent, evil, or rife with rogue employees. These days, the CIA even posts potential story lines on its website, according to spokesman Todd Ebitz. In 1999, the CIA allowed producers of âIn the Company of Spiesâ to film at CIA headquarters, a first for the agency. About 50 CIA employees joined the cast as extras, and hundreds packed a premier at the headquarters. In 2001, the agency allowed crews from âThe Agency,â a CBS television drama, to film inside CIA headquarters. The CIA planned a red-carpet reception before the show first aired, but the party was canceled after the Sept. 11 terrorist attacks. One episode in the series, which aired for two seasons, featured the CIA firing a Hellfire missile from a Predator drone at a terrorist in Pakistan, a relative rarity at the time. A few weeks later, Beckner recalled, a CIA drone strike occurred and made headlines. In 2003, producers of âThe Recruitâ also worked closely with the CIA. The agency wasnât pleased that the film showed a CIA trainee being beaten in a mock interrogation, but the DVD extras included a CIA officer explaining that the scene was fiction. And star Al Pacino plugs a cherished agency myth in the movie, saying the CIAâs failures are well-known but its successes are secret. âThe CIA has been subtly influencing motion picture content for more than 15 years,â said Tricia Jenkins, author of âThe CIA in Hollywood,â the first academic appraisal of the CIAâs efforts to influence popular entertainment. Jenkins said the CIAâs cultivation of Hollywood paid off after the Sept. 11 attacks. âEven as the CIA was subject to incredible public criticism for failing to predict the attacks, there came a spate of TV shows and movies depicting the CIA as competent, effective and willing to share intelligence,â she said. The bloom has worn off somewhat. In this yearâs âSafe House,â starring Denzel Washington, a senior CIA officer is willing to kill his own employees to keep secret a file detailing misdeeds of the CIA and other intelligence agencies. Such negative depictions help explain why senior spies and intelligence professionals were eager to highlight their role in helping Navy SEALs finally find and kill bin Laden at his hide-out in Abbottabad, Pakistan, in May 2011. To that end, Bigelow and Boal were granted significant cooperation by CIA officials and the Pentagonâs intelligence chief. Ironically, the Defense Department did not provide production assistance for their Iraq war movie âThe Hurt Locker,â which won the 2009 Academy Award for best picture. This time, the pair were offered an interview with a Navy SEAL, the newly released documents show. The SEAL was not involved in planning the raid and the meeting never occurred, according to Lt. Col James Gregory, a Pentagon spokesman. The pair also were taken into a room at CIA headquarters called âthe vault,â where tactical planning for the Bin Laden raid had taken place. A CIA spokesman said that the term is agency jargon for any secure room, and that it was empty the day they visited. The documents also show how the filmmakers are seeking to construct a tense narrative of the decade-long hunt that finally led to bin Ladenâs death. For his part, Adm. William McRaven, head of Special Operations Command, which includes the SEALs, brushed off all the fuss. At a news conference Thursday in Tampa, Fla., he downplayed the Bin Laden raid as anything special. Keegan reported from Los Angeles. David S. Cloud in the Washington bureau contributed to this report. French Camp, CA to Raymond and Eufemia Acosta on May 22, 1933. Ray served his country proudly in the United States Air Force. He received his Bachelor's degree in Education and worked as a Teacher for 20 years. Ray enjoyed spending time with his family and friends. He had a love of sports, everything from basketball to football to baseball. Ray enjoyed camping and other recreational activities. Ray was active in the catholic community and attended St. George's Catholic Church in Stockton. Carmen Acosta, his parents, his sister Lupe Perez and brother Mario Acosta, precede him in death. Ray is survived by his daughter Elizabeth Acosta, grandchildren; Edward and Tina, and great grandchildren; Raymond and Edward. He is also survived by his siblings; Julio Acosta, Gabriel Acosta, Frances Ping, Pauline Saldivar, Peter Acosta and John Acosta as well as numerous nieces and nephews. DAYTON, Ohio (WDTN) - The National Museum of the United States Air Force recently received a million dollars boost for new construction. Bennett Croswell, President of Pratt & Whitney, Military Engines, announced May 30, the commitment of $1.2 million by United Technologies Corporation and Pratt & Whitney to support construction of the fourth building at the museum. âWe are grateful to United Technologies Corporation for its generous gift of $1.2 million. UTC has been a longtime supporter of the National Museum of the United States Air Force," said Charles Faruki, former Chairman of the Air Force Museum Foundation Board of Managers. "Their generosity contributes significantly to closing the gap required to achieve the $48.7 million goal to construct the fourth building." Faruki said the addition of the fourth building will allow the Museum to tell the full Air Force story and expand educational programs in science, technology, engineering, and mathematics. With yesterdayâs announcement, the Foundation has raised $38.7 million of its $48.7 million campaign goal. Current plans call for construction to begin in 2013 and the new building to open in late 2014. These manuscripts were produced as part of the Foreign Military Studies Program. This program interrogated the leading German officers on their World War II combat and staff experiences and compiled reports from information gathered from these interrogations. Three of the four manuscripts were written by Helmuth Greiner. On 18 August 1939, he was transferred to the Wehrmacht Operations Staff (Wehrmachtsfuehrungsstab), in Hitlerâs headquarters, as Keeper of the War Diary. Greiner was removed from his post on 22 April 1943, because of his known anti-national socialist sentiments. These pages of notes, compiled in 1945, are based on the memoranda which Greiner wrote in the capacity of custodian of the War Diary of the Wehrmacht Operations Staff during the daily situation reports and discussions held at Hitlerâs headquarters from August 1942 to March 1943. This manuscript conveys a narrative history of events in the German Armed Forces Supreme Command Headquarters during World War II. He based his work on notes taken at various conferences, copies of final drafts for entry in the War Diary, copies of Hitlerâs directives, orders and documents he was able to save from destruction at great personal risk. Greiner attempted to restore the War Diary, at least partially on the basis of the memoranda which were still in his possession at the time of the writing of this manuscript. Greiner gives accounts of various factors which influenced decisions in both the military and the political spheres. Brief graphic descriptions are also included of the characteristics of members of Hitlerâs staff. Operation Barbarossa was the code name for the German invasion of the Soviet Union during World War II, launched on June 22, 1941. Greiner was able to use his skill as a military historian and his first hand knowledge from his physical presence at the command and control of the Third Reich, to eruditely forge a history of the German planning for Operation BARABOSSA. Greiner covers the German-Russian treaty, Hitlerâs rationale for the attack, details of the planning, and the effects of other events of the war on the operation. Schramm was the official war diarist from January 1943 to the end of the war. As official War Diarist of the High Command of the Wehrmacht, Schramm had unprecedented access to Adolf Hitler and the highest echelons of the German military and its inner workings. The Battle of the Bulge was the biggest and bloodiest single battle American soldiers ever fought, one in which nearly 80,000 Americans were killed, wounded, or captured. BACM Research through PaperlessArchives.com publishes documentary historical research collections. Materials cover Presidencies, Historical Figures, Historical Events, Celebrities, Organized Crime, Politics, Military Operations, Famous Crimes, Intelligence Gathering, Espionage, Civil Rights, Civil War, World War I, World War II, Korean War, Vietnam War, and more. Source material from Federal Bureau of Investigation (FBI), Central Intelligence Agency (CIA), National Security Agency (NSA), Defense Intelligence Agency (DIA), Secret Service, National Security Council, Department of Defense, Joint Chiefs of Staff, Department of Justice, National Archive Records and Administration, and Presidential Libraries. HKHS Graduation will be held on June 22, 2012 at 6:00 pm. Two Teams of students at HKMS won First and Second Place in the state at the United States Army Science, Technology, Math, and Engineering Competition. This nationwide competition asked students to use science, math and technology to design and build solutions to real world problems.Â Members of the First Place winning team were Stanley Chrzanowski, Connor Agro, Troy Early, and Parker Rogers. The second place team included Sawyer Platt, Julianna Rushford and Emily St. Lawrence. The first place winners each received $500 and the second place winners each received $250. The students were recognized by the Board of Education at our May Education Committee Meeting. Over 200 students from area school districts visited Haddam Killingworth High School on May 21st to compete in the first Shoreline Mathematics Challenge.Â Students worked in teams at this competition to solve life size mathematics and logic puzzles. For the second consecutive year Superintendent Thiery will be conducting interviews with every member of the senior class prior to graduation.Â These interviews present an opportunity for graduating seniors to provide insights and feedback on their experience in RSD 17 as well as advice for how the District can improve. At its May 15, 2012 meeting, as a result of an open and competitive bidding process, the Board was able to approve a new three year trash hauling contract for a price $42,000 less than the existing contract.Â In addition, the Board approved the expenditure of certain capital items, including the installation of a new roof on the Central Office building, as well as replacing the stage curtains at KES and HES. The Policy Subcommittee of the Board is reviewing the 5000 series of policies, focused on student issues.Â Input from the community is welcome. Researchers have consistently concluded that parent involvement leads to improved educational performance in children.Â Parent involvement is often defined as having an awareness of schoolwork, comprehending the interaction between parenting skills and student success in schooling, and a commitment to consistent communication with educators about student progress.Â Would you like to see our District more strongly embrace and foster parent and community involvement?Â Attend the Community Conversation on June 2nd at the Middle School from 9-1, and share your thoughts and ideas on parental and community involvement in the education process. Submitted by the Regional School District 17 Board of Education. Summer is officially in full swing after Memorial Day weekend, complete with sweltering temperatures and grilling galore. This weekend the City of Rolla will officially welcome the season with the 17th Annual Summerfest. The event was originally conceived as a way to promote downtown Rolla and quickly became a popular yearly event with dozens of activities for the young and the young-at-heart. This year's event begins Friday and includes all the traditional favorites â" a classic car and motorcycle cruise in and show, outdoor "drive-in" movie, Association of the United States Army picnic, Miss Route 66 Pageant, skateboard track, giant sand box, inflatable games, downhill derby, bicycle and tricycle races, horseback rides, burnout contest, fire truck pull, Tour-de-Phelps bicycle ride. As usual, the events will be topped off with a free outdoor concert and street dance, and event Rolla Communications Director Scott Grahl says is always at the top of his list. "You are right there downtown with all of the vendors and the ice cream and all of that ... some of the stuff, if you've seen a lot, but the music is always new," Grahl said. Traditionally the concert has been played by local bands, and this year's headliner is no exception with Pseudo Blues taking the stage. The band is a trio of Rolla residents with Merle Alderson on guitar, Jim Henry playing base and Monte Henderson on the drums. "There's such a variety of music that we play, and this is a family event, so we are probably going to mix it up quite a bit," Alderson said. "Although, there's probably not going to be any country, unless, of course, it's Johnny Cash." Alderson said the majority of the music will be classic rock. This year's concert will have one difference over past years â" an up-and-coming music talent is being brought in from Los Angeles to play between pseudo Blues' two sets. Her name is Kait Weston, and she is a You Tube sensation who recently signed with a record company. "The lady that created the Jackson 5 is the one who actually signed her," said Kevin Baney who helped the Summerfest Committee recruit Weston to sing at the event. In the world of social medial Weston is known for delivering high quality covers of artists like Rhianna and Katy Perry, although she does have original music that will appear on her upcoming album. Her performance at Summerfest will predominately consist of her covers. "He (Jim Larson of the Summerfest Committee) thought that she would be a great idea to get more of the younger people involved in Summerfest," Baney said. Another popular event is the classic car show, which Grahl said seems to grow and change every year. "The classic car show has really become very large, and people really seem to enjoy that," Grahl said. The car owners begin with a Route 66 group cruise from St. James Friday evening and then park the lovingly restored vehicles on Pine Street for everyone to admire. If the kids aren't impressed by the cars of yesteryear, bring them over to the bandshell Friday night for an outdoor movie under the stars beginningÂ at 9 p.m. This year's flick is Dolphin Tale, and the experience will be complete with all the free popcorn you can handle. The night will come to and end after the movie Friday night, but the festival will be in full swing bright and early the next morning. On Saturday the car show will continue all day alongside an arts and crafts show. By 9 a.m. downtown Rolla will also be dotted with skateboard games, a giant sandbox, inflatable games and a climbing wall courtesy of the Army National Guard. If it's a race you are looking for Saturday and Sunday are your days. Saturday will feature a 5k/10k race to benefit the Missouri Special Olympics as well as tricycle and bicycle races for the kids and a downhill derby. The Hellbender Bicycle Road Race will take place Sunday. Other competitive events for the weekend include the burnout contest and tennis tournament. For more information on any of the competitive events or to see the complete schedule of events visit route66summerfest.com/calendar. 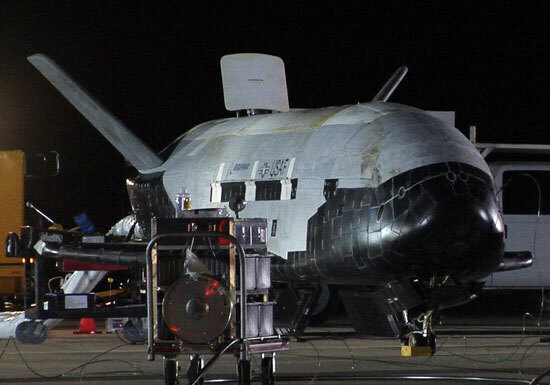 After having spent over a year in space, the United States Air Forceâs secret X-37B spacecraft will be coming in for a landing sometime in the next few weeks. The miniature spaceplane, which looks like a 30 foot long Space Shuttle with angled fins and a bulbous rear end, has apparently performed exceedingly well in its mission â" except what that mission is remains a secret. This is the second orbital mission for the X-37B, and the first for this particular vehicle. The first missionÂ was launched on April 22, 2010 and lasted until December 3 of that year. These sorts of long-duration missions are part of what the spaceplane is designed to perform. After being launched into orbit atop a rocket, the craftâs cargo doors open â" similar to the Space Shuttle â" and a solar panel is unfurled to provide power for the craft. Observations from amateur astronomers have suggested that the craft is capable of changing its orbit once in space, giving it some surprising flexibility. So far, all anyone will say about this mission is that it was meant to test âspace technologies.â During its time in space, the Pentagon has denied that the spaceplane is being used to develop orbital weapons, and claims that it was being used to spy on Chinaâs Tiangong-1 space station were refuted. Itâs possible that the Air Force is still testing the craft, though the craftâs long duration missions and reusability would make it an excellent spy craft. Though its mission will soon be at an end, itâs almost certain that we wonât ever know what was accomplished. I suppose the most we can hope for are some cool pictures. Residents, military husbands and wives, family members of fallen heroes and elected officials gathered in Indian Head on Wednesday to remember the fallen during their annual Memorial Day remembrance ceremony. Henry E. Lackey High School sophomore Brandon Paulin spoke about pride for serving in the military while Lackeyâs Air Force Junior Reserve Officers' Training Corps (ROTC) presented the colors.Â United States Air Force Senior Master Sergeant Homer Allison delivered the invocation.Â Retired US Navy Aviation Electrician and American Legion Post 223 Commander Charles âAlâ Turner spoke about the true debt owed by Americans, debt to the fallen soldiers of the United States Armed Forces. Maryland State Delegate Peter Murphy (D: 28th District), Town of Indian Head Mayor Dennis Scheessele and Vice Mayor Ed Rice also delivered remarks before introducing the main speakers.Â Captain Brian Bakke and Louise Tomberlin Pyles spoke about their fallen relatives, U.S. Army Private Joseph Bolger and United States Marine Corps Staff Sergeant Carl Tomberlin, who died in World War II.Â They spoke about their sacrifice and the pride they had fighting for their country. Retired U.S. Air Force Senior Staff Sergeant Louis Knight closed the ceremonies with the benediction before the colors were retired by Lackeyâs ROTC. News Feedback NOTE: Views expressed below do not reflect the views or opinions of TheBayNet.com, or the employees of TheBayNet.com. Send This Story to a Friend! The Mansfield Town Council took time before its meeting Tuesday to observe Memorial Day. United States Navy veteran and council member Christopher Paulhus led off the ceremony with the Plege of Allegiance and followed with a tribute to verterans and active duty personnel. "Teach the youth what Memorial Day is about," Paulhus said. Let Patch save you time. Get great local stories like this delivered right to your inbox or smartphone every day with our free newsletter. Simple, fast sign-up here. "Say a prayer for the families who have lost a loved one or those who still have families in an area of confliect," he said. "Pray they come back - your loved ones to celebrate Veterans Day, not Memorial Day." The following is a list of Mansfield soldiers who served and died in the Civil War. The names were compiled in 2011 by Keith Wilson for the Mansfield Historical Society. Daniel Travis, Jr. a/k/a Daniel Jones Jr. Various client reviews and information about the law firm Patrick J. Mclain. DALLAS, TX, May 31, 2012 /24-7PressRelease/ -- Since 1990, former federal prosecutor, criminal court judge and United States Marine Corps defense attorney (JAG) Patrick J. McLain has applied his uncommon knowledge and experience in criminal law to protecting the rights of individuals facing serious criminal charges in North Texas and federal crimes nationwide. It's Not Just About Winning, It's About Making Lives Better. At the law office of defense attorney Patrick J. McLain, you will find the personal attention, knowledgeable legal advice and determined representation you need and deserve in the fight of your life. "Patrick McLain helped me in a DUI case that surely would not have gone in my favor if I would have tried to hire a lawyer of lesser standards. He is a well versed man with extremely high standards. A prior Marine who understands what a military member may have to lose. He does not add any BS to his conversation, He states it the way it is. Although his services are expensive, the cost of losing would have been much more than that. It is said you get what you pay for, with my military retirement on the limb I needed a lawyer I could count on. He is the lawyer that will represent you the way you deserve!" - Connie M.